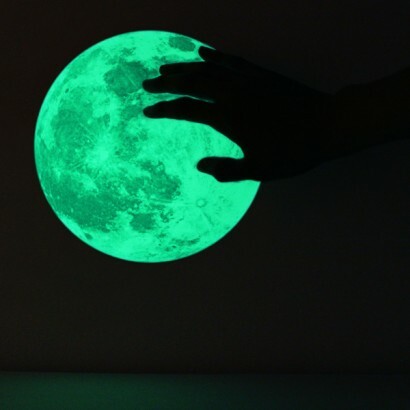 This amazing pack of super glow in the dark moons contain a 20.5cm diameter moon, an 8.5cm moon, and 4 smaller moons at 3.5cm. The moons are made from real astrophotographic images of the moon taken by French photographer Norbert Rumiano in Nantes France. 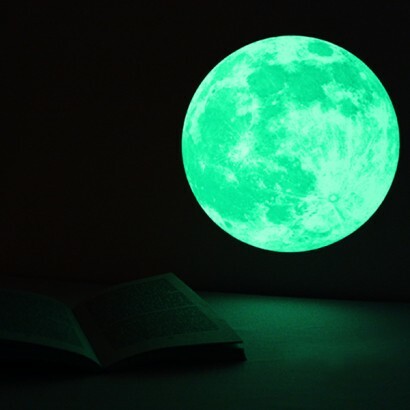 Available in blue or pink print, to fit in with various decor themes, all moons glow luminous green after dark. 1 x large (20.5cm diameter), 1 x medium (8.5cm diameter), and 4 x small (3.5cm diameter) included. The Moonlight wall sticker has a strong adhesive film that can be used on various wall types, however once the image has been stuck it can be difficult to re-locate the image without damaging the sticker. Step 5: In order to glow the Moonlight wall sticker needs to be exposed to the light of your room. It's recommended that you charge (expose to light) it for at least 30 mins or upto 6 hours for a full charge. Step 6: Turn off the lights in the room and enjoy the moonlight! 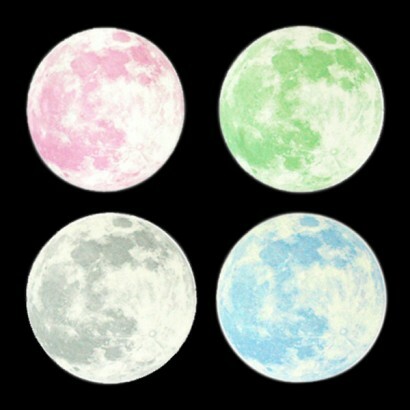 Find out more about how glow in the dark works to get the best from your glow moon stickers.